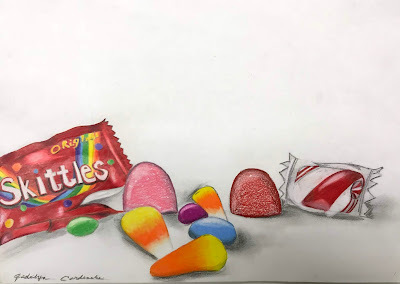 Before reading this article, click here for a complete list of supplies you can use for this and other 'Helpful Art Teacher' drawing projects. 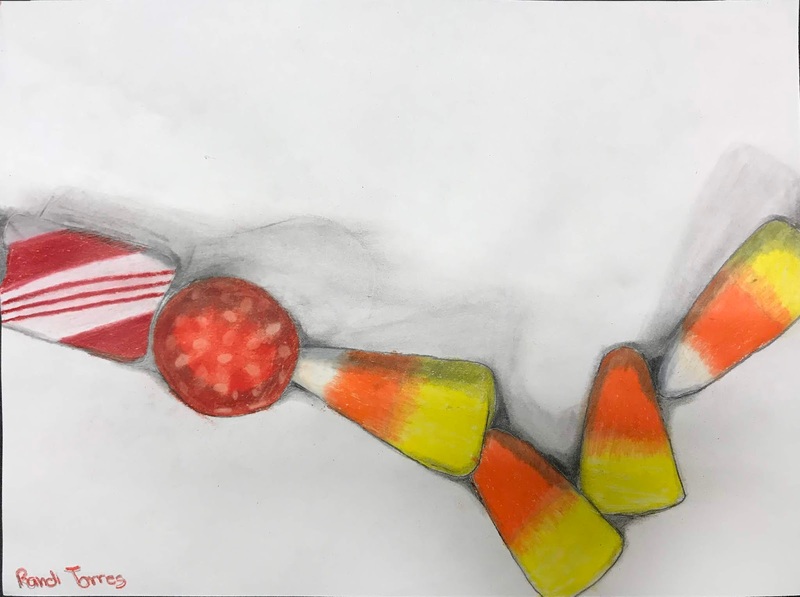 My students started out by arranging their candy on a small blank index card. I required them to overlap the pieces at least three times and to create an arrangement that went off the edge of the card on at least three sides. 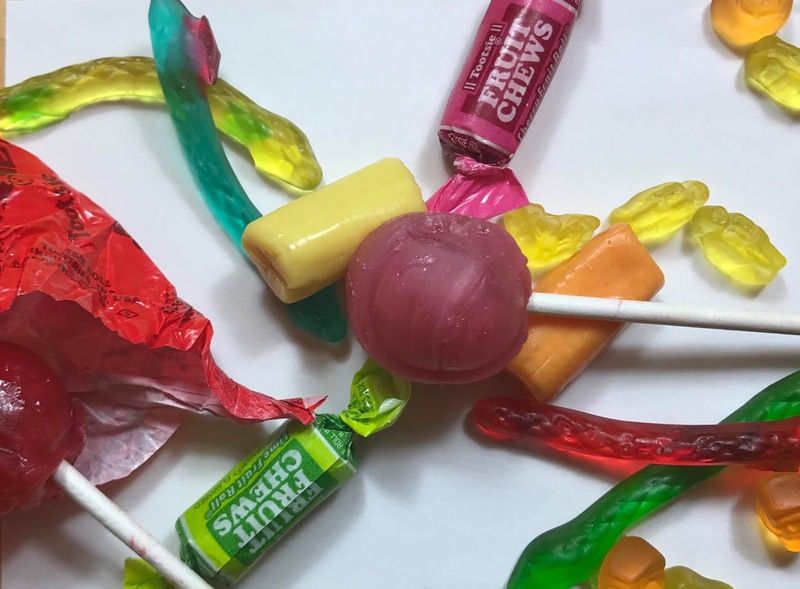 Each piece of candy had to either touch or overlap another piece of candy. They then took a photograph of their work with their cell phones, so they could remember the set up for the next class. The next step was to enlarge the design on to 9"x 12" drawing paper. If a piece of candy touched the corner of the index card, students knew to enlarge it and draw it in the corner of their larger paper. If a lollipop stick went off the edge in the middle of the right side of the card, they located the same spot on the larger paper before drawing it. In this way, they were able to scale their drawing up without needing to measure. They then shaded their drawings using 6B, 2B and HB pencils to establish highlights, mid-tones and shadows. I showed them how to emphasize form by using curved lines to shade round objects, angled lines on flat geometric surfaces and horizontal lines on the table surface. They then followed the same motions to blend the shadows on each object using a paper towel wrapped around their finger or a blending stomp. To add color to a shaded drawing, we used Prismacolor colored pencils and continued to emphasize form with each stroke. I taught the class to color over all parts of the shaded candy, including the shadows. The shaded parts magically appeared darker due to the inherent translucency of the colored pencils. 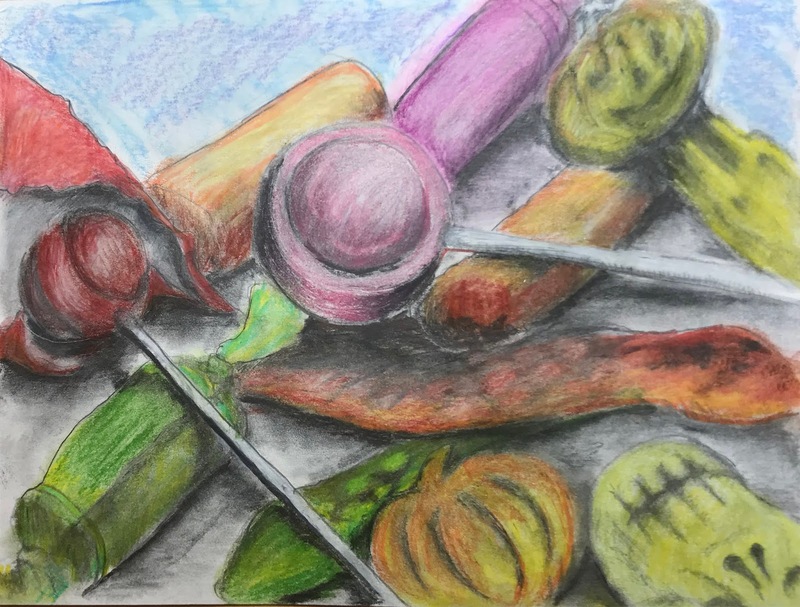 Some students also found the need to emphasize form by shading with 6B pencil over colored pencil, to recover details that were lost. Next, we soaked a Q-tip in denatured alcohol and use it to gently blend the colors and smooth out forms. When they were done, students discovered that the alcohol could also remove or lighten select areas and a white pencil could be used to re-establish the highlights, creating a nice finishing touch. This technique does not work with other brands of colored pencil because they contain too much wax. It also doesn't work with isopropyl rubbing alcohol. You can get denatured alcohol at a hardware store. 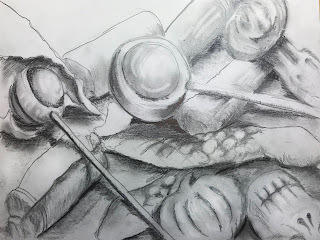 My students tested this technique on a separate paper, prior to using the alcohol on their still life drawings. Try overlaying two colors and then blending. 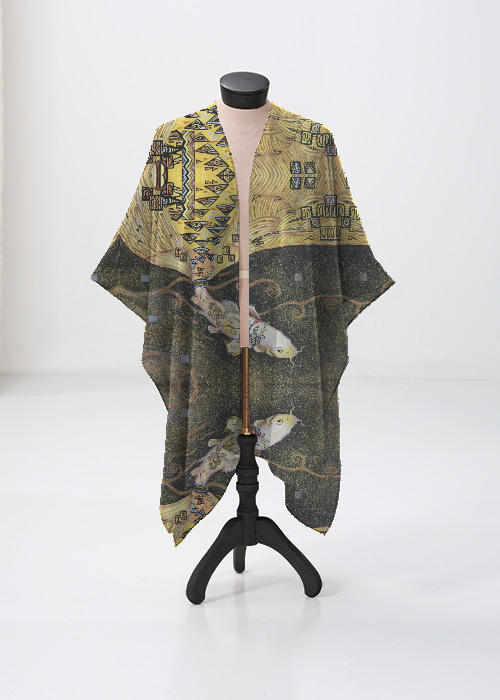 Experiment with thicker and thinner color layers to create different effects. Warning: denatured alcohol is flammable. Do not smoke in your studio or use candles while you are using it. It is also poisonous to drink, just like rubbing alcohol. Protect young children and pets in your household by not leaving any open containers unattended. Only pour a small amount at a time and use Q-tips to spread it. It is not poisonous to touch but it will dry your skin, so you may want to apply some lotion to your hands after you are done. If using larger amounts of denatured alcohol, the vapors can be irritating to breathe, however my students only poured a very small puddle in a small plastic jar lid, so this was not an issue for us at all. The video below demonstrates how to shade in the drawing, by following the three dimensional forms and using highlights, mid-tones and shadows. 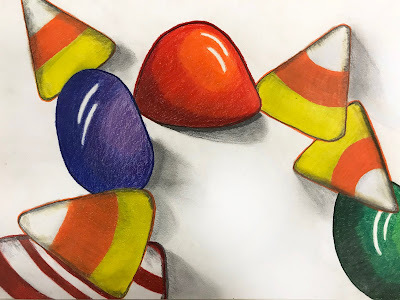 The video below shows how to use Prismacolor colored pencils and denatured alcohol to add color to the shaded drawing.